A Minnesota state trooper last week stopped a car on Interstate 94 in Otter Tail County near Fergus Falls and found a passenger sitting on 300 pounds of marijuana. Last month, also in Otter Tail County, a trooper at a traffic stop confiscated 200 pounds of marijuana, worth about $600,000. 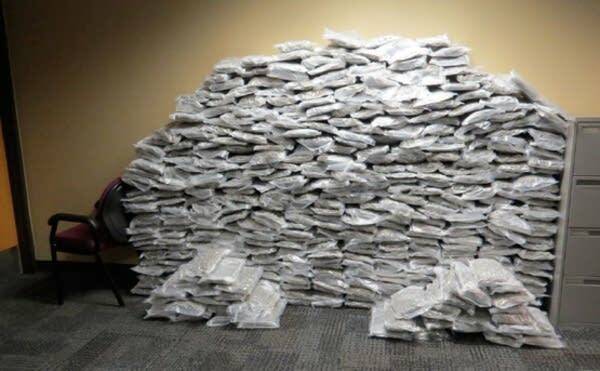 Farther west in North Dakota, a sheriff's deputy also found nearly 500 pounds of pot in a vehicle stopped on I-94 near Jamestown. Officials in Minnesota and North Dakota say nationally, drugs have become more readily available, leading to the increasing drug traffic they're seeing on the region's roads. "They're some of the bigger ones that we've ever had," said Minnesota State Patrol Col. Matt Langer. "Whether that's a trend or not, I'm not sure as we sit and talk about this today, but it's concerning for us that we see that amount of drugs on our highways." Drug arrests in North Dakota rose 60 percent from 2012 to 2017 with the same level of enforcement, said North Dakota Highway Patrol Lt. Michael Roark. "Most of the larger shipments that we've encountered have originated out of North Dakota and certainly destined for locations outside of North Dakota as well, so I think it's just where we're at right now nationally in dealing with illegal narcotics," he said, adding that drugs are generally more available from a variety of sources. There's been a dramatic increase in marijuana smuggling in the past few months, said Brian Marquart, who oversees 21 violent crime enforcement teams around the state for the Minnesota Department of Public Safety. The state patrol seized 2,600 pounds last year, more than a six-fold increase from the 390 pounds seized in 2016. Most of it is coming from Oregon, Colorado and California, all states where there is a legal marijuana industry, he said. Investigators are seeing increasingly sophisticated organizations moving drugs into the state, he added. "You're also seeing the attitude that I can make a quick buck," he said. "Go to these states, find a back door black market where I'm able to get larger quantities and try to make a quick dollar." 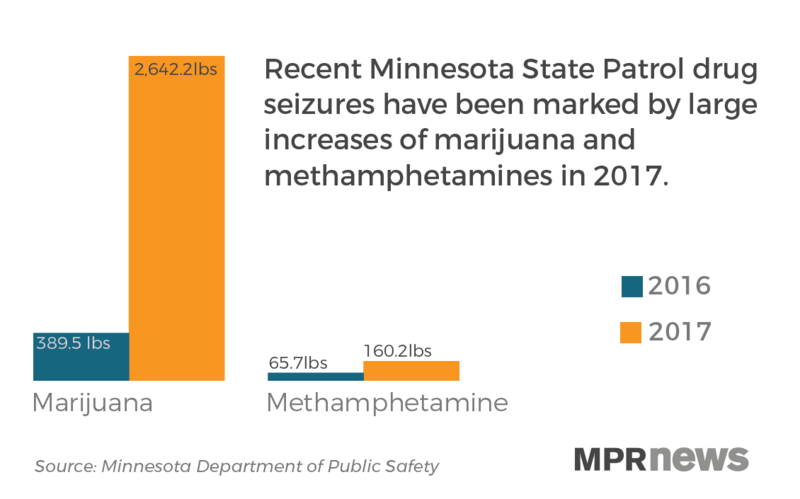 Beyond marijuana, Minnesota is seeing "huge amounts of methamphetamine, marijuana, marijuana concentrate and now cocaine being transported in to the state," Marquart said. The State Patrol also seized 160 pounds of methamphetamine last year compared to 65 pounds in 2016. There's a flood of cheaper, more potent methamphetamine coming from Mexico, he said, noting that the number of discovered meth labs in Minnesota has fallen dramatically because it's cheaper to buy the drug than to make it. Drug task forces are also seeing more of the synthetic opioid fentanyl, which has been blamed for heroin overdose deaths across the state. Marquart doesn't expect the increase in drugs entering Minnesota to slow this year. "You know, whether it be cocaine, methamphetamine, marijuana, heroin all being laced with fentanyl is another very scary proposition that's occurring," he said.